Our thinking and perceptions of reality and what we believe is ‘possible’ and ‘impossible’ create the boundaries of our abaility to see the opportunities which frequently arestaring us in the face, but which are often disguised as problems. Expanding the limits of our thinking and perceptions opens the door to entrely new ways of capitalizing on both perceived problems and opportunities. 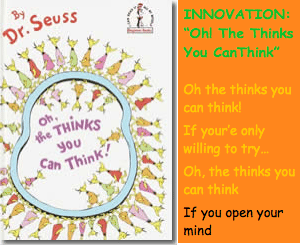 John’s Seussian inspired ‘Think!’ keynotes will not only have your audience smiling and laughing, but most importantly, questioning their own self-imposed limitations. Approaching issues related to breaking established norms and paradigms in this manner, John enables his audiences to honestly face the questions that must be addressed in order to pave the way for real innovation to occur. In most instances, it is the organization itself and its people which pose the greatest roadblaocks to real innovation. The NIH – ‘Not Invented Here’ syndrome is alive and well in most organizations, regardless of their size, and this is one of the greatest inhibitors of ideation and innovation, especially in regard to open innovation. Moving your people from NIH and resistance to embracing the external ideas and possibilities presented by open innovation can be a herculian task. However, John effectively sidesteps participants’ biases by sneaking under their radar. It’s hard to maintain a mental wall against an idea when you are laughing and so John uses illustrations and analogies to disarm his audiences. As each keynote John presents is created from a clean sheet of paper specifically for the unique needs and circumstances of that audience, he is able to address those thinking patterns that are most prevelant and which hold back the audience from embracing innovation. Your attendees will come away with a smile and newly gained appreciation of the power of open innovation and the ways in which they can personally benefit from it.